The Governor of Edo State, Mr Godwin Obaseki, the President of Indonesia, Mr Joko Widodo, Coordinating Minister for Maritime Affairs, in Indonesia, Mr Luhut Pandjaitan, and President & Chief Executive Officer, PT Pertamina (Persero), Mr. Elia Massa Manik, on Tuesday at the ongoing Africa Indonesia Forum in Bali, highlighted the barriers to sustainable trade between Africa and the Asian country and proffered home-grown solutions to the challenges. With the theme: “Developing sustainable Trade and Investment Cooperation Between Indonesia and Africa,” the panel session, which was moderated by Director, Standard Chartered Bank, Anthonia Okoh, focused on agriculture, technical cooperation, financing, strategic industries, manufacturing and digital economy. Sharing the Edo State experience, Obaseki told his co-panellists and participants, the successes being recorded through reforms in critical institutions of government, such as the creation of an Edo Geographic Information Service Agency to create a land data bank, the repositioning of the Ministry of Physical Planning and Urban Development and the synergy between the state government and the Royal Majesty, the Oba of Benin, Oba Ewuare II, to remove the encumbrances in land acquisition, a major factor of production. “Our land reforms are yielding positive results as more investors have expressed their desire to set up factories in Edo State. We have strengthened the institutional framework for physical development management in the state and a few days ago, I gave a directive to the Ministry of Physical Planning and Urban Development to ensure a 48-hour turnaround time for approval of building plans in the state, within the next six months. “We have also tasked the Edo State Geographic Information Service Agency to ensure that Certificates of Occupancy (C of O) and Rights of Occupancy (R of O) are issued to applicants within thirty (30), days of application,” the governor said. He assured the Asian investors of his administration’s commitment to an investment-friendly climate that has supported the best oil palm companies in Nigeria and called on investors to leverage on the growing positive socio-economic outlook of Edo State. “Both Okomu Oil and Presco Plc. have embarked on very ambitious projects to expand their plantations in the state, and are currently doing well in the Stock Market. These achievements are tied to the friendly investment climate we have created for businesses in our state, and with the Benin Industrial Park, the Gelegele Seaport, the Benin Modular Refinery and our robust bouquet of agricultural programmes, Edo is indeed, the best place to invest,” he added. L-R: Coordinating Minister for Maritime Affairs, Republic of Indonesia, Mr. Luhut Binsar Pandjaitan; President Director/Chief Executive Officer (CEO), PT Pertamina (Persero), Mr. Elia Massa Manik; Edo State Governor, Mr. Godwin Obaseki and CEO, PT TIMAH, Mr. Mochtar Riza Pahlevi Tabrani, at the Africa Indonesia Forum in Bali, Indonesia on Tuesday, April 10, 2018. Welcoming participants to the event, the Indonesian President, Mr Joko Widodo, highlighted the gains inherent in extensive relations between his country and Africa. With its vast and abundant fertile soil, Indonesia is a major global key producer of a wide variety of tropical agricultural products. Palm oil is particularly important to Indonesia, as the country is the world’s biggest producer of the commodity, providing about half of the world’s supply. For Africa, agriculture accounts for up to 60 percent of all jobs on the continent and more than 50 per cent of GDP in many African countries. In this sense, discussion on sustainable and holistic agriculture management is crucial for both sides’ economic and social benefits, the organisers said. 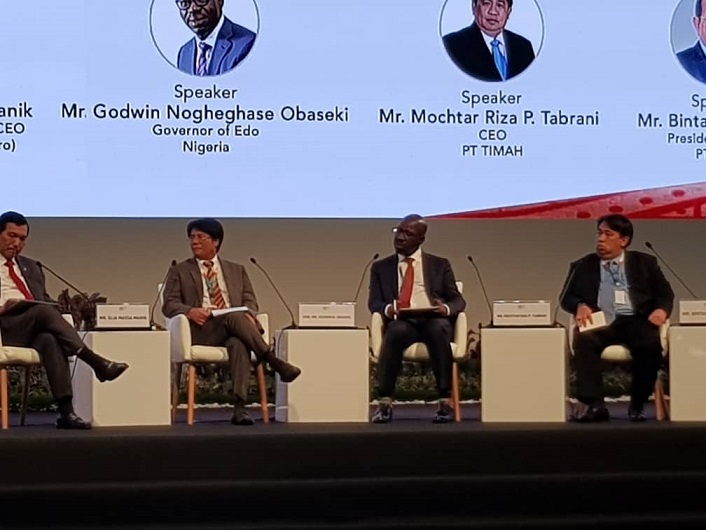 On financing, the organisers of the event explained that “financing is one of the key components in trade and investment cooperation, Indonesia continuously explores innovative ways to strengthen economic relations with African countries. One example is that since 2015, Indonesia has been implementing the National Interest Account (NIA) program to boost Indonesia’s trade and investment, particularly to untapped markets, including Africa. “Under the NIA program, the government allocated Rp 1.3 trillion (approximately USD 96 million) for trade financing with Africa until 2022 and is planning to enhance the budget in the future. To date, a number of trade activities with Africa have been already funded through NIA. “The Indonesian government is also considering the possibility of establishing a mechanism that can enhance Indonesian investment in African continent through counter trade financing scheme. “The manufacturing sector plays an important role in Indonesia’s economic relations with Africa, therefore, addressing trade and investment barriers such as high tariffs and NTBs are timely for continued cooperation. The discussions to open up both markets through trade agreements in addition to other mechanisms should be further explored, and it is imperative to seek creative ways in order to address the issues. “There are currently 25 companies doing business with Africa and we would like to see this number grow in the future, including through Small and Medium Enterprises (SMEs) cooperation. The inclusion of digital economy as a topic of discussion reflects the fact that both Indonesia and Africa are well positioned to benefit from rapidly accelerating technological change that can unlock growth and leapfrog the limitations of physical infrastructure. On technical cooperation, the panels will highlight the principle that Indonesia’s engagement with Africa does not merely focus on the economic benefit, but also intends to establish a true partnership for mutual progress. Other speakers at the forum are the Chief Executive Officer PT TIMAH, Mr Mochtar Riza Tabrani, and President Director PT Wika, Mr Bintang Perbowo.